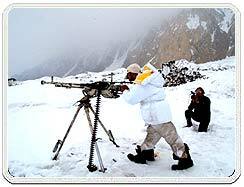 The Siachen glacier lies in the excessive north-central part of Jammu and Kashmir near the border of India and Tibet. 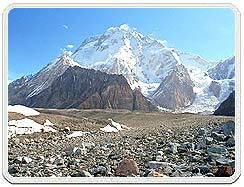 With a length of about 72-km, Siachen is identified as the biggest glacier in the world outside the Polar Regions. situated on the north-facing slopes of the Karakoram Range, Siachen feeds the Mutzgah or Shaksgam River that flows parallel to the Karakoram Range before entering into Tibet. Large tributary glaciers similar to the Shelkar Chorten and Mamostang open into the chief glacier from both sides of its trough. The trunk glacier and its tributaries are in the form of a vast ice field, particularly during the winter season when there is continuous snowfall for several weeks at a stretch. The Siachen glacier lies in a huge channel more than 2-km wide and the sides of the glacier are strewn with rocks and boulders. The central part of this glacier, however, is a vast snowfield. Numerous icefalls have been formed at the junction of little valley glaciers and the trunk glacier. Lateral moraines happen at the confluence of larger tributary glaciers and the trunk glacier. The sidewalls of the glacial trough are steeply sloping and avalanches roll down these slopes quite often, particularly in winter. This glacier encompasses a vast are in winter. There are virtually no signs of recession. This tract is more or less devoid of a vegetative cover due to its high elevation as well as its latitude. 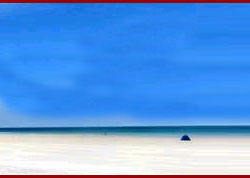 The bulk of the total annual precipitation is in the form of snow. To the east of the Siachen lies the Rimo glacier group, a group of three glaciers -- North, Central and South -- located at an altitude of between 6,000 and 7,000 m above sea level. Between them, these glaciers have almost 700 -sq-kms of ice, which at places is 100 m deep. 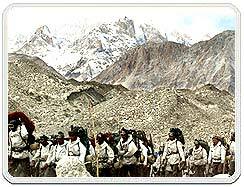 Thus the Siachen glacier empire contains about 2,000-sq-kms of ice surface and almost 200 cubic kilometers of ice.